Setting up a new project in Qt Design Studio is aided by a wizard that guides you step-by-step through the project creation process. The wizards prompt you to enter the settings needed for that particular type of project and create the necessary files for you. Code needed for deploying applications to devices. Because the UIs do not contain any C++ code, you do not need to build them. To test how well your designs work, you can preview the UIs on the desktop or embedded Linux devices. For more information, see Previewing. General generates projects that are suitable for all target platforms. Mobile generates projects that work well on mobile devices. Desktop generates projects that work well on the desktop. Select File > New File or Project. Select the type of your project, and then select Choose. In the Name field, enter a name for the project. In the Create in field, enter the path for the project files, and then select Next (or Continue on macOS). In the Screen resolution field, select the screen resolution for previewing the UI on the desktop or on a device. In the Qt Quick Controls 2 Style field, select one of the predefined UI styles to use, and then select Finish (or Done on macOS). .qml file defines a UI item, such as a component, screen, or the whole UI. ui.qml file defines a form for the UI. qtquickcontrols2.conf file specifies the preferred style and some style-specific arguments. imports folder contains a Constants.qml file that specifies a font loader for the Arial font and a qmldir module definition file that declares the Constant QML type. For more information, see Module Definition qmldir Files. 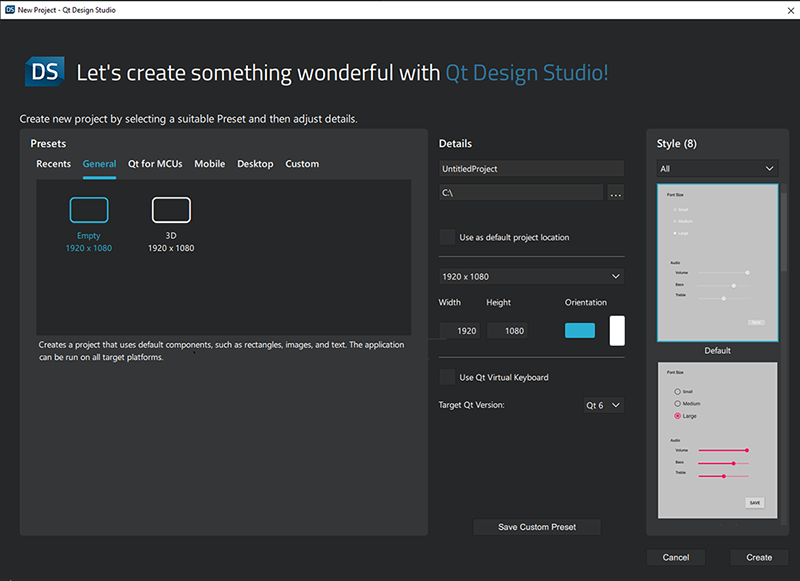 In addition, the QtQuick subfolder contains the Studio components and effects QML types. Qt Quick UI File generates a UI form with one of the above types as the root item. Qt Quick Views generates a GridView or a ListView. Button creates a push button with a text label. Switch creates a switch with on and off states. Pane provides a background that matches the UI style and theme. StackView provides a stack-based navigation model. SwipeView enables users to navigate pages by swiping sideways. FontLoader imports custom fonts to the project for deployment to devices. For more information, see Using Custom Fonts. ListModel adds a list model to the project.